In a strange coincidence, both Derik Badman and I happened to have recently read the first four volumes of Keiji Nakazawa's classic '70s manga, Barefoot Gen. While I have tremendous respect for Derik as a writer and friend (he's one of the few fellow comics bloggers I've met in person), I found myself at odds with his assessment of the series, and initially commented on his Facebook status to that effect (he wrote that Gen was "too didactic, too preachy, to the detriment of the story. Also, everyone is a jerk"). More recently, as part of the Manga Moveable Feast, Badman posted a longer article in which he described the reasons for his dislike of Gen. Although I initially resisted, this prompted me to draft a response. Since I had read library copies of Gen, my comments below are drawn from memory; however, this is not significant, as Gen, unlike just about any comic series I've ever read, including Maus, left an indelible impression. Still, wanting to have more of a rounded perspective before responding, I went back to read Nakazawa's Comics Journal interview (from issue #256 in October 2003). As an unexpected bonus, the same issue also included a detailed think piece on Gen by Japanese comics scholar, Bill Randall. With that perspective, here are some of my thoughts in response to Derik's criticisms of the series. "This is melodrama. Damn it is melodrama. And it suffers for it. It’s too much; it’s over the top; it’s ridiculous. Even before the bomb it’s too much with the Japanese berating Gen and his family for being “traitors” because their father speaks out against the war. Apparently he is the only one, as he seems to have no sympathizers. He is the lone protester, victim exceptionalism. By the time the bomb hits it’s already too much. Over said, over shown, and over played. Get me out of here." "(Gen) never shies from melodrama and never elicits effects so self-consciously 'powerful' as to spoil the internal consistency of the work. The melodrama emerges naturally from Gen and his life, the deaths of his loved ones and his struggle to survive." In other words, the story's melodrama was an artistic choice on Nakazawa's part, but that doesn't mean it undermines the story's message at all. In fact, I think the fact that Nakazawa recounts his memory of the events with some degree of melodrama makes the story more universal; it engages the reader and seers itself into their memory. It's hard to imagine anyone who reads these first four volumes forgetting the character of Gen. His sheer tenacity, positivity in the face of despair and spirit to survive is unforgettable, even if it's hammered home. Regarding the fact that Gen's father was the only outspoken opponent of the war, Nakazawa recalled in the interview how speaking out of against the Japanese empire was dangerous. Unlike the United States, freedom of speech was not a right enjoyed by the Japanese citizens, particularly at the height of the war. In fact, Nakazawa's father was arrested and imprisoned for his political beliefs when Keiji was in first grade. "They took my father away and put him in jail for a year and a half. When I asked where he'd gone, my mother lied and said he'd been drafted into the Army. They held him in the Hiroshima Prefectural Prison. Apparently, they tortured him." Not only was his father the only person brave (or stupid) enough to speak out against the war, he was also likely the only adult that would speak of politics at all around a seven-year-old, so I don't think the portrayal is false. Rather, as I mentioned in my original comment on Badman's Facebook status, Nakazawa is being faithful to his memory, and telling the story from his childish perspective. Of course there were others against the war, but it's very unlikely a seven-year-old would have encountered them. This portrayal may still feel unbalanced, but I hope I have made clear the mitigating factors for this. "The only decent person is the Korean neighbor. Korean’s were conquered and enslaved by the Japanese. The Korean neighbor is the one nice guy, despite how horrible he has been treated, he’s nice to Gen and his family. But not any of the Japanese. No one else is nice. God, was Nakazawa this pessimistic about his countrymen? Could it really have been that horrible? I don’t know, but it doesn’t work as fiction. This isn’t reportage or autobiography. It is fictionalized. And as fiction it doesn’t work. It overburdens. It paints with so broad a brush." I think Badman's assessment is overly harsh here. The TCJ interview was particularly enlightening in understanding what specific aspects of Barefoot Gen are actually fictionalized, and after reading it, it's clear that, while some parts are indeed embellished, the vast majority of the story, and particularly all of the events related to Gen and his mother, are based directly on Nakazawa's own experiences. After a lengthy passage in the interview in which Nakazawa describes his own memories of August 6, 1945, it's clear that Gen's story of the immediate aftermath is nearly identical to the artist's. Nakazawa even confirms that "I definitely based it on my own experiences growing up." However, Badman's chief issue seems to be with some of the secondary characters outside of Gen's immediate family. For example, after the bomb, Gen and his mother, with their newborn baby girl, travel to Eba to stay with friends. While they were there, they were treated horribly, subjected to little sympathy and much scorn by their unwelcoming hosts. Interviewer Alex Gleason pressed Nakazawa to commit to what extent his experiences were identical to those in the book. They were "exactly as I wrote about it Gen," he replied. "They let us stay in a storeroom they had, but they were really nasty to us." Of course, nobody can know definitively how much embellishing took place (certainly some), but we have to take Nakazawa at his word that this plotline was based on his own experiences. Badman is correct that other aspects of the story are more fictionalized, and perhaps these are somewhat flawed in their portrayal (it's more debatable, at any rate). For example Gleason asked Nakazawa about the subplot regarding Seiji, the young painter who lost the use of his hands in the bombing, and was ostracized by his family, only to be inspired to learn to paint using his teeth after meeting Gen.
"It didn't happen to me, but it was a combination of true stories I heard and things that happened in my neighborhood. For example, there really was a young A-bomb victim who taught herself to paint with her teeth. And Seiji's household, which was treated like a pariah by the neighbors, is modeled after a house we kids called the haunted house because a badly injured victim lived there." "I wanted to tell the story of the artist to show how people can overcome the greatest adversity. If you can't use your hands, use your teeth. As I wrote at the beginning of Gen, the real theme of the story is symbolized by wheat, which springs back no matter how many times it's trampled." Finally, one last point is worth considering. In order to get this series published, Nakazawa had to make concessions. In the manga market of the '50s and '60s, there was little to no support for an adult-targeted series about the A-bomb. Not only had Japan, as a society, yet to fully come to terms with the bombing (Nakazawa described how people never spoke of the incident publicly in Tokyo in those days), but, in order to get published, he had to use the manga anthologies geared toward children. Even Tezuka had yet to publish his more mature works at this point. Thus, it's important to see this work in its historical perspective when judging it. 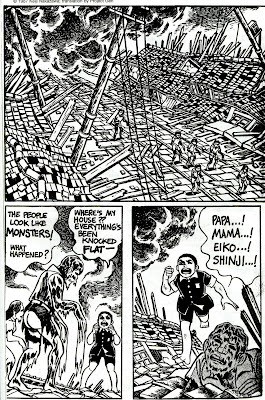 Barefoot Gen may not be the fully mature work that we're used to seeing in the alternative comics industry of 2011, but it was virtually unprecedented in its day. Ultimately, as I conveyed to Derik initially, I don't think his complaints about the series are all that important when compared to the real power of the work - its seering depictions of the horrors of the bomb. After reading these volumes, what will undoubtedly linger forever in my memory are the images of victims covered in glass, or with sheets of melted skin hanging from their bodies; the shocking depictions of starving orphans scavenging for food, or digging in the rubble for their loved one's bones. These meticulously rendered images are what makes Barefoot Gen a masterpiece worth reading. As Spiegelman pointed out in his Introduction, "this vivid and harrowing story will burn a radioactive crater in your memory that will never let you forget it." Sadly, my Comics Journal collection does not include 256. I'd like to read what Bill had to say about it. What can I say? I don't doubt Nakazawa's autobiogrphay, but the example of the painter character, where he has mashed a few stories together into one is the type of thing that starts taking the story over the top for me. It just didn't work for me as narrative art, despite any arguments for it as a message piece. Those are different lenses to evaluate the work through, and certainly can meet with differing criticisms. I'm going to donate my copies to the library, so maybe someone else would be moved by the work as you were. all I recall about my piece is that 1) it's mostly praise, 2) it's so old I want to totally rewrite it, 3) I went with a "this is not really autobiography" angle, but in the interview Nakazawa said "It's my autobiography," so that's that. I did swing by Ohio State to read "I Saw It" in the cartoon library. That was fun. I'm posting a more detailed look at your argument over at your site, Derik. To conclude, I'm horrified to discover I'm a Japanese comics scholar! In the future I'm going with "Japanese comics ukulele troubadour" to keep expectations low. Hey Bill. Great to hear from you. For what it's worth, I enjoyed your TCJ piece on Gen. I was actually quite surprised by the number of supporters who found themselves agreeing with Derik's more negative assessment of the work, so I'm glad to hear you weigh in. In the end, we just agreed to disagree. BTW, there are far too few ukulele ballads about manga comics, so I look forward hearing your compositions. Maybe you can do a world tour of rodeos and sushi bars? See, there's no escaping expectations.